yarn can stay in bag until next project--keep moths out by folding the cut corner over and using a paperclip or tape to seal the hole shut. The bags very lightweight and pulling yarn out is sometimes an annoyingly two-handed procedure. If your yarn tends to bias, then it is really best to unspool the yarn from the outside of the ball. There are various yarn unspoolers (sometimes called yarn lazy susans) for sale, or you can make one of scraps from this brilliant design shared here with kind permission of Linda S., Eugene, OR. After Linda gave me one of these years ago in a knitting class I taught, I use it all the time. It works splendidly. If you are handy, you probably have most of the ingredients around the house already. 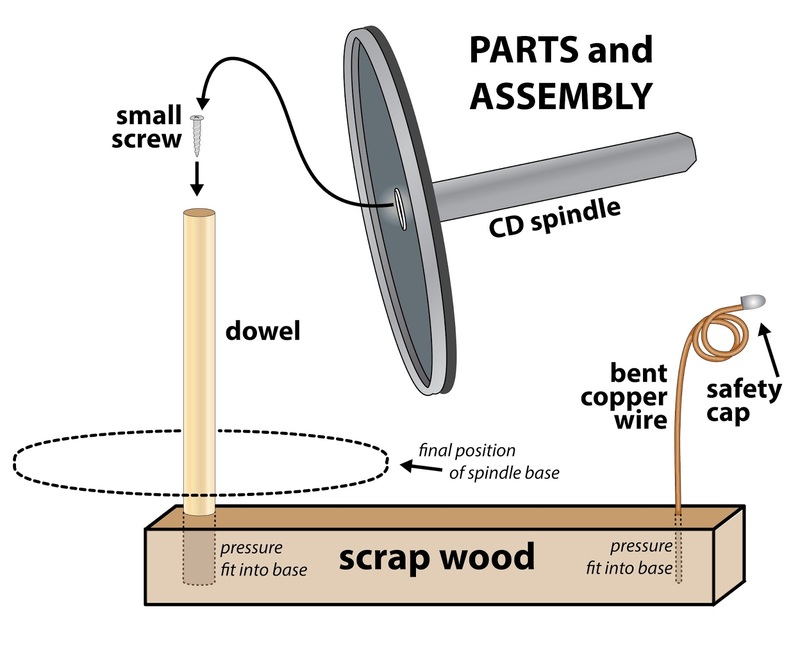 CD spindle--used for CD storage--look for one with a hollow spindle. Using the pliers, double back the very end of the wire. Prepare base for yarn feed by drilling a small hole for the wire, centered at one end of the wood strip, about 1/2" in from end. Insert the straight end of wire into the hole, it should pressure fit tightly. If it is somehow too loose, I recommend gorilla glue--follow the package directions, that stuff is amazing. 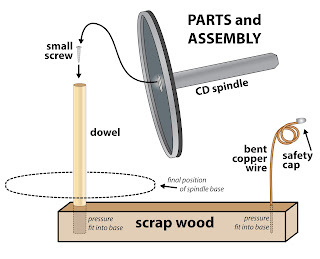 Prepare base for yarn spinner by inserting the 5/16" dowel into the hollow spindle of the CD holder and make a mark about 1/8" below where the dowel protrudes from the spindle. Add another mark below this equal in depth to the depth of the scrap wood base. Cut the dowel at second mark. Drill a 5/16th hole centered on the opposite end of the scrap wood from the copper wire, the hole should be about 1/2 inch in from the end. The only tricky thing about this whole deal is drilling this particular hole as straight as you can! Pressure fit the dowel into the hole. If it doesn't want to go, sand it down slightly, then rub it with a bar of soap. If it's somehow loose, consider gluing it in place. test fit the CD spindle onto the dowel, it should just about hit the scrap wood. Drill a small guide hole, then screw the small screw into the top of the dowel. The screw should protrude about 1/4" or 3/8 " out the top of the dowel. Test fit the CD spindle again, it should now spin freely on the screw head. If it squeaks, rub a bar of soap on the screw head; if it hits the base, raise the screw; if it is too high and wobbly, lower the screw, or substitute a shorter screw. 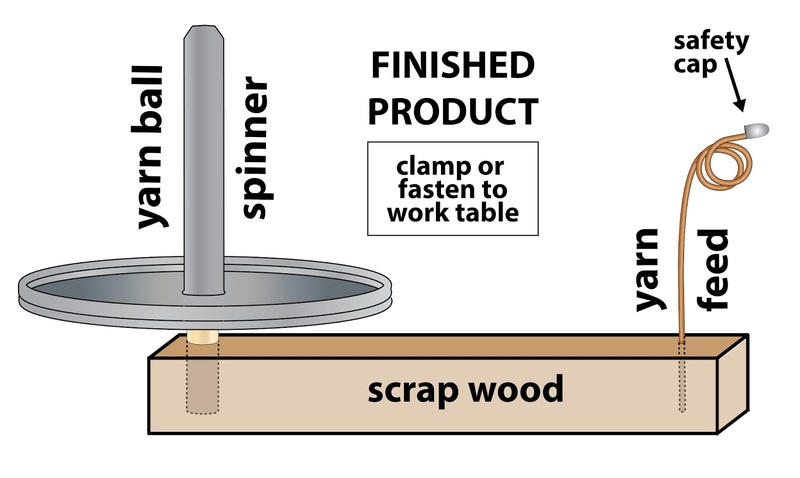 Optional: insert a length of conduit or plastic plumbing pipe over the outside of the spindle if your particular CD spindle is too short to fully pierce through a ball of yarn with part of the spindle protruding. Sand the ends so they won't catch on your yarn. Attach your new yarn lazy susan to your work table with the spring clamp, or fasten it permanently in place if you prefer. If you love this design, credit Linda. If the instructions are messed up, that's on me, so let me know if something's hard to follow here, OK? Yarn unspoolers make knitting a pleasure--the yarn is firmly clamped in place and doesn't go skittering around, yet unspools easily for knitting. Lazy susans take up more room than many other methods, plus, you cannot store your project in them, like you can with various other knitting organization schemes, so that's even MORE room taken up. Worst of all: the cats LOOOOOVE them! Creative potters and woodworkers offer "yarn bowls" for sale. Each individual's design has different features--check before you buy. 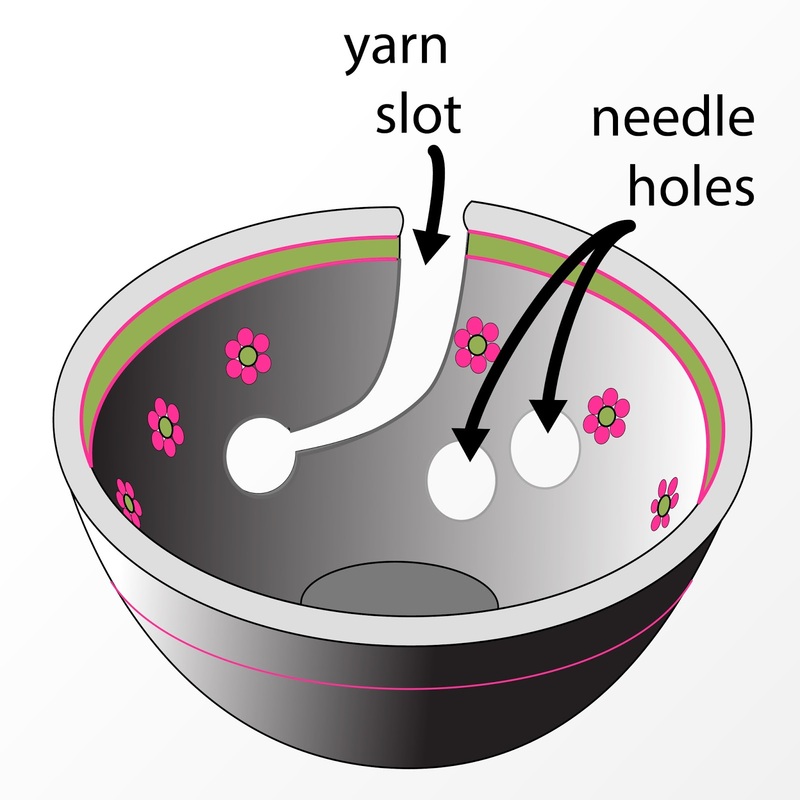 One desirable feature would be a yarn slot for the running yarn to feed through, rather than a hole. A hole seems like an OK idea, but when you want to put the yarn aside for a while--such as during a carry over on a stripe--you realize you cannot get the yarn out of the bowl without cutting it. A slot makes switching yarn around much easier. A ceramic bowl is heavy and stays put, some wooden bowls are heavy, also. If you place one ball of yarn per bowl, the yarn is free to jump around in the bowl. This allows an outside feed off the ball, so the yarn comes off with no biasing. IKEA had some small pop-up baskets for sale a few years ago: they were called NOJE, came 3 to a package: white with orange, or green or blue binding at the top. They are sort of like mini-laundry hampers, about 8 inches tall and 9 inches across. I stockpiled dozens and have never regretted the purchase. They smash flat for getting multiple projects into one suitcase, then pop up again when you get where you're going. They are deep enough to allow two balls of yarn to jump around freely when pulled--good for yarns which might bias and therefore need to be unspooled from the outside. 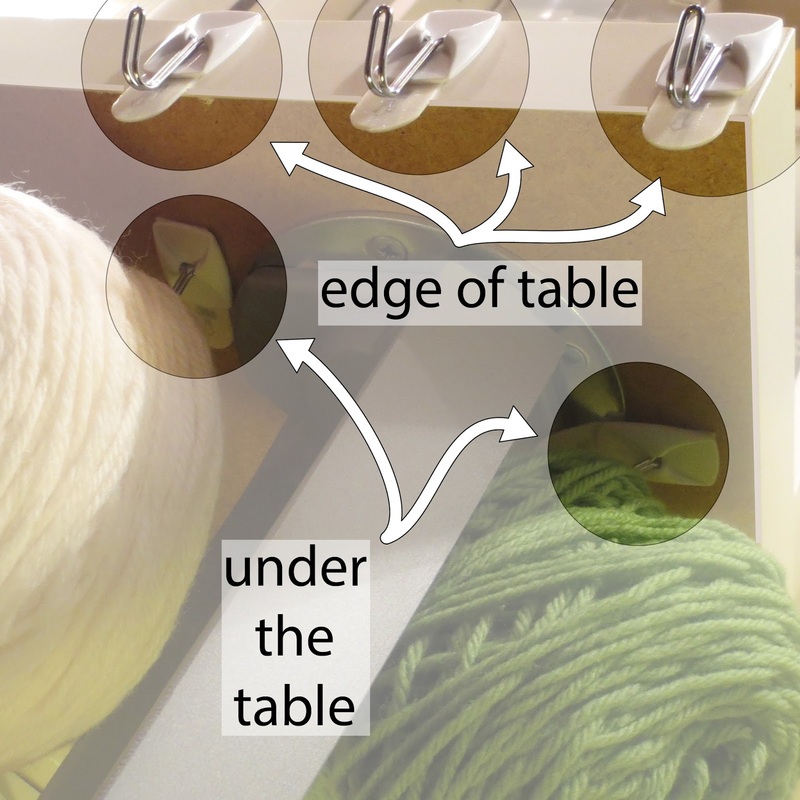 NOJE baskets don't have a yarn guide like a yarn bowl or a lazy susan, but you can easily rig up yarn guides out of binder clips. Binder clip handles come off and go back on again if you'll simply flip the handles up, then squeeze the two sides of any one handle together towards one another. Because the yarn goes through these removeable handles, the yarn can be taken in and out of the guides without cutting. When it's time to put the project-basket into the suitcase, you flip the binder clip handles down, out of the way. When its time to knit, flip the handles back up again. 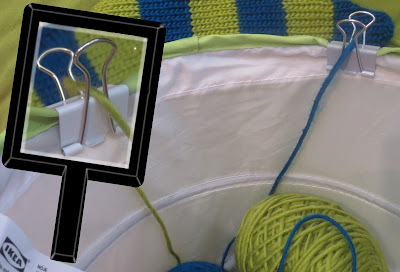 Naturally, it will occur to you that binder clips aren't restricted to use on-pop up baskets: you can attach them to an ordinary ceramic bowl, any kind of basket, etc., thus adding yarn guides where ever you like. You can put the cable of your circular knitting needle under the binder clip also. However, the baskets don't work very well with straight needles. Pop-up baskets are to pack, easy to use, and keep projects separated: perfect for traveling with (or storing!!) multiple projects in a suitcase. 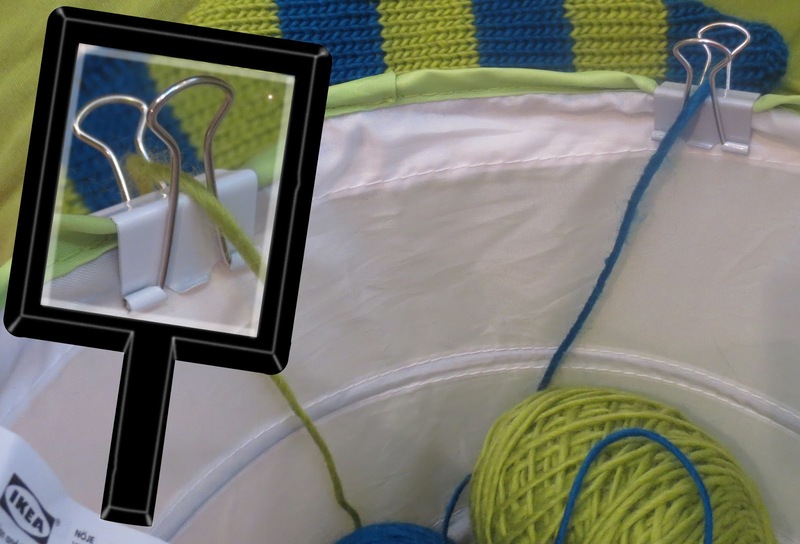 Binder clip yarn guides work great with pop-up baskets, but they will attach to many other surfaces also, thus adapting all sort of containers to be knitting baskets/bowls. Baskets do not accomodate straight needles very well--the points want to poke right through the cloth. Lastly, a method that works well wherever you are, whether in your favorite knitting nook at home or on vacation in a hotel room. With this trick you harness the amazing power of command brand hooks to hang your balls of yarn in any order you like, on pretty much any surface you like. Command hooks feature a removeable two-sided sticky backing. One side sticks to the hook, the other side sticks to the wall, the instructions come in the package. The backing comes off very easily by s-t-r-e-t-c-h-i-n-g the backing downwards ... BUT!!! pull SLOWLY or it will tear. When properly removed, a command hook leaves no mark on any surface, whether wall, table edge/bottom, or even an airplane or tour bus seat back. 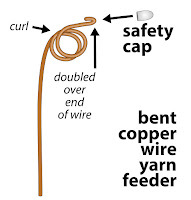 In my experience, the best ones are the small size with the wire hook illustrated below. This style also works stuck under a table because the wire hook dangles freely from the plastic backer. In my knitting nook at home, I have two stuck UNDER my work table and three stuck to the edge of my work table, so I can hang up to 5 different balls of yarn right next to one another, exactly where I am working. Even with the most complex patterns, I've never used all the hooks at the same time. I take a pocket full of hooks and strips with me on my travels, too. And you know, you can combine KnitziMitzi's bag-trick with the hook-trick: hang the bags ON the hooks and you really are good to knit in pretty much any situation anywhere. Command hooks up the least room of any system, and they the most adaptable--there is always some surface you can stick these to! Adaptable: command hooks go up and take down in minutes but can also be used in a permanent situation, such as the knitting nook work station illustrated above. As for storage: you can hang smallish WIP over one or two of the hooks, just make sure you catch either the barrel of a straight needle, or the cable on a pair of circs. small hooks are only rated to 1/2 lb. Do you have any neat ideas for organizing color-knitting yarn to make it easier to knit multiple colors at a time? STUART ladderback jacquard gallery, part 1: Skeleton hat "Round Dance"
For working long floats in color knitting, TECHknitting recently introduced the STUART technique of ladderback jacquard. STUART--which stands for Slip Then Unhook And Rehook Twice--is a substitute method: there is no trapping long floats via twisting, there is no knitting the stitches to the surface as is done with double-knitting ladderbacking. 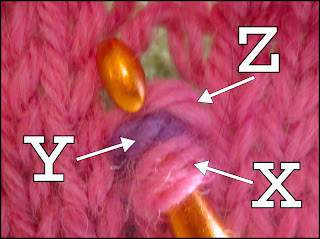 STUART is used when color-knitting in the round, best employed with the "two-handed" method. This post shows STUART in action on a long-float project: a skeleton hat. The next post will show a modified version of STUART for going"around corners." But for today, a photo-gallery of the unmodified STUART method applied to this long-float hat. A closer view of the skeleton hat, click to enlarge. My version has four skeletons, the original from which it was adapted features six. This wonderful little hat is adapted from the "Round Dance" pattern by Thomas P.* (xeo on Ravelry). 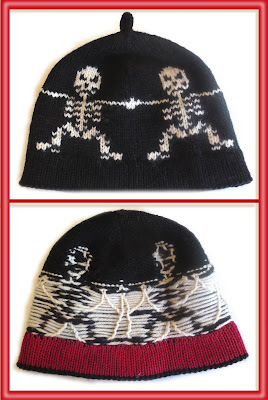 This free pattern--once accessible via Ravelry, but now available only through the Wayback Machine archive--features skeletons dancing around the brim--just the thing for an autumn hat. Below is a photo-essay of the hat's construction so you can see for yourself how easy it is to knit looooong floats with the STUART method. You'll have to go to Thomas' (free!) PDF to see the entire chart, but this little snippet, above, shows the heart of the problem: The dotted lines represent the repeats, and you can see the very, very very long floats--23 stitches at the skeleton's "waist." This project featured various sets of floats. as you can see from the opening overview photo. The above photo shows only the floats as they appear between the skeletons. These were very long, yes, but also irregular. In the end, I decided to work only one catchment column between the skeletons, as shown above. This did break the "five-stitch rule" for how far a float should travel, but hey, rules are meant to be broken, right? Let me walk this back a little bit though: unless you have at least *some* experience with long floats, consider adding catchment columns more frequently than is illustrated here, at least til you've tried it out a few times! Above is the catchment column from the inside. Somehow--as you can see in this photo and the previous one-- I slipped two floats under one stitch, probably when I was messing around with dropping stitches experimentally. In fact, I chose this photo of all the ones I took, just to show you that you kind of can't really screw this up. See, all those slips into the catchment column are just "temporary parking spots." When they are let out as part of the STUART process, such irregularities will make no difference to the finished product. Above, I have begun the process of letting out the catchment column: this is the view from the fabric surface. As each fabric stitch (black) is let out, the floats (white) are released to the fabric-back. Above you see the longest floats. These are much too long to even dream of leaving unfastened on the inside of a hat. Above: starting to re-latch the catchment column. Instead of a crochet hook, I am using a large latch hook, the kind you use for latch hook rugs. Catchment column all latched up. Note that even before blocking, there is very little fabric-distortion. This is because the catchment column is knitted with essentially the same amount of yarn as it is re-latched with: there is no excess slack in the front fabric to created gaps. Above: Starting the latch-up of the ladderback. When you have it in your hands, it doesn't look near as confusing as this--it's just hard to operate the camera while holding the work and the latch-hook. The mommy ladderback and her baby ladderback. D'awww. The long floats were so very very long in the skeleton torsos that additional ladderbacks were required to squirrel away the excess float-slack. Mommy and TWO baby ladderbacks in process. I took out the bobby-pins stitch-holders for this photo, normally I would not leave naked hanging loops like that. cast on: In adapting this hat, I began by using scraps of knitting worsted-weight wool and the COWYAK method to provisionally cast on the correct number of stitches for four full repeats at a gauge of 5 st/in. facing: After a few rows in waste yarn, I switched to a red sports-weight yarn, and, reserving a tail several feet long, I knit with the red yarn. Despite the thinner yarn, I did not use smaller needles, but instead used the same needles as I planned to work the hat with. I worked 11 rounds of stocking stitch. This created the red hat-facing. turning welt: I then knit one round in black, then purled two rounds in black according to the linked directions, thus creating a "beefier reverse stockinette jogless turning welt." body of the hat: Switching back to stocking stitch, I worked 13 rounds before beginning the skeleton pattern in white on a black background. color work: I worked the skeleton in the STUART method as shown above. working the skulls: The skeleton-heads were worked using an intarsia-in-the-round method which I have not yet posted--when I do post about that method, I will place a link here. However, there would be nothing wrong with continuing to the top of the pattern--skulls and all--using the STUART method. Every fourth round, at four evenly distributed spots centered between the skeleton heads, I worked a 3-stitch (non-leaning) decrease. At the hat top, I formed the last 4 stitches into an I-cord, then worked that for a sufficient length to create a loop. Note that, if you wanted a taller hat, you'd delay starting the decreases until you had worked a few more rounds. Finishing: the inside of the hat was mostly finished when the knitting stopped. The ends at the top were pulled into the I-cord with a crochet hook, the insides had few dangling ends because I had worked the STUART method of fastening the ladderbacks as-you-go. Because there is a a facing at the bottom, a lot of the ends were going to be caught behind that, so they really didn't need a lot of delicate fussing--no one will EVER see what's behind the facing. After skimming in those ends which appear above the facing (mostly behind the ladderbacks where you simply cannot see them) the only thing left to do to do was remove the waste yarn from the cast-on and sew the facing down, one overcast stitch per live knitting stitch, using the length of red yarn I had left hanging at the time of the original cast on. I tucked the tail of the facing into the pouch formed by the facing itself, never to be seen again and gave the hat to my teen-age son in time for Halloween. Piece of cake!! This is the second post in a series. The first post introduces the STUART method, the third post shows some modifications of the STUART method for rough-use situations. *Thomas granted permission to feature his hat. 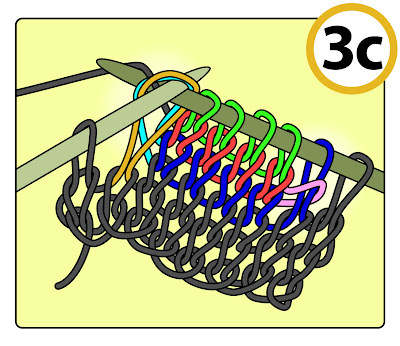 Back in 2007, when I first published a post about the how-to for color knitting, I promised to show a trick for invisible long floats (invisible stranding). I'm not sure why this has taken nearly a decade to bring the promised technique before you, but today (ta da!) I am keeping that promise. Herewith, the STUART method for taming long floats in color knitting. Have a look: on this finished sample, that's an 11-stitch stretch between the two purple color-patterns, and the floats run the entire 11 stitches! In technical terms, STUART is a form of ladderback jacquard--have a look at the back--see that ladder? Yet, fear not. 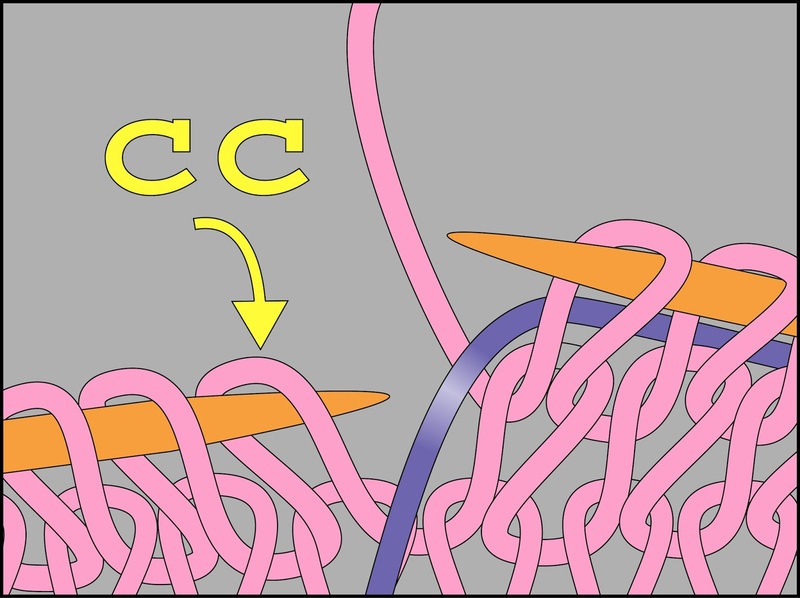 This is not a trick for "trapping long floats," or "tacking long floats" via twisting, nor is it a trick for knitting the back at the same time as the front via dk standing (double knitting stranding). STUART is much easier method, nowhere near as complicated as actual ladderback jacquard, and don't let the fancy ladderback look fool you either. This is going to be a piece of cake. When I first started trying to figure out extra-long carries in color knitting, I examined many commercial knits for clues. If you've ever looked at the back of a commercial color-knit, you may have noticed that the color(s) not in use are hooked up in ladders running up the fabric-back. This method is called "ladderback jacquard." Ladderback jacquard is a version of double knitting, but not at a 1:1 ratio. In short, the yarn in the front is knit at the regular rate, while the yarns stranded across the back are worked only in certain widely-spaced columns: this accounts for the appearance of the ladders. If you are interested in the specific details, please let me direct you to a beautifully illustrated tutorial by fiber-artist Lorna Hamilton-Brown showing how to work this technique on a home knitting machine. But oh boy! As clever as all of this is, it hurts my brain to think about translating this method to a hand-knitting version. No doubt some super-clever knitter will work out how to tame long floats via double knitting at different frequencies, but that person will not be me. I am WAY too lazy and the idea is WAY too complicated. The STUART method introduced today is inspired by the ladders on the backs of commercial knits, it is a form of ladderback jacquard, but believe me when I tell you that in STUART, the ladderbacks are worked by a much easier and very different method. SO.much.easier. STUART stands for Slip, Then Unhook And Rehook Twice. The slipping parks the middle of a long float on the fabric surface in a "catchment column," interrupting the long float into shorter floats during the knitting process. The unhooking releases the float from its parked position, returning the floats to their original length. The unhooking action is nothing other than letting out a ladder, as you would do to correct an error in the rows below. The re-hooking is done twice, once to fasten up the let-out ladder of the catchment column, and once on the back face of the fabric where fastens the very long floats into a loose sort of ladder on the back. Before we get to the illustrated step-by-step, however, I want to be clear about when it is best to work the STUART trick. STUART is a form of two-color knitting, best worked in the round. I work this (as I work all two-color-knitting) by the "two-handed" method. 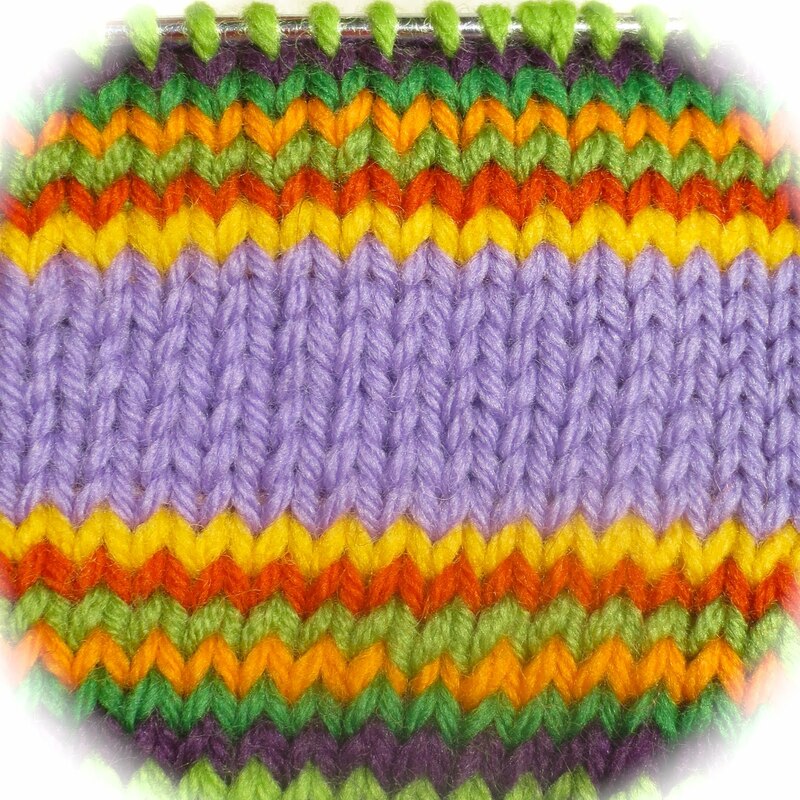 The sample which illustrates this post is part of a tube I knit, and the illustrations show only a small portion of the tube--a bit more than one repeat. Although not shown on the illustration, there were several repeats worked: in this way, the yarn was carried all the way around the tube. This particular pattern is a repeat of 14 stitches worked over 7 rounds in height. Slipping, Then Unhooking And Rehooking Twice. With STUART, after the 5th stitch, the float is interrupted by being parked on the fabric surface. Note that the carry-yarn is not knit, and it is not twisted, either. Instead, it is slipped into a temporary position in front of a column called the "catchment column." In this case, we'll use the center column of the 11-stitch run as the catchment column--that would be sixth stitch (the column marked in yellow on the opening photo). Slipping over the catchment column is the first step in the STUART method, the "S."
How this is worked is simple. You would knit the three purple stitches of the bar. Next, you knit 5 stitches of pink background fabric, carrying the purple yarn loosely across the back. This is ordinary two color knitting. Now we are at the catchment column, column 6, and ready to slip the purple yarn to the fabric front. The slipping itself is a three-part process. Before knitting the pink stitch in the catchment column ("cc") you bring the purple yarn forward. Next, knit the pink stitch. Finally, bring the purple yarn to the back. leaving a "blip" on the front fabric face. What you have done is to slip the purple yarn from the fabric-back to the fabric-front before the catchment column--column 6--and then slip it again to return it to the back after the catchment column, with the end result that the purple yarn is slipped around the catchment column. To be sure you did it right, tug a little on the purple yarn, it should slide through the fabric freely. After the catchment-column slip, work 5 additional stitches in pink, continuing to carry the purple yarn rather loosely as a float in the back. Finally, begin the next pattern repeat by working the three stitches of the next purple bar. When you've worked in this manner for the entire height of the color pattern (in this case, the seven rounds of the purple rectangle), the seven slips will have made seven blips in the catchment column. Again, there will be one blip for each row of the color pattern, as you can see on the first picture below. on the fabric-front in the middle of its too-long run. 7 rows of color pattern=7 rows of slipping =7 blips in the CC. This is what the work looks like from the back. As for the correct tension, you will soon figure out the tension required: if you have doubts, you can adjust the tension by stretching the fabric out, then releasing it, just before you end the float by knitting the first stitch of the upcoming purple rectangle--this is a good way to be sure the purple floats contain enough slack where they won't pucker when the fabric is stretched. 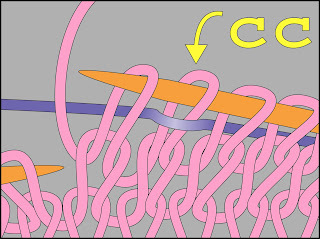 Note that the carried purple yarn-float will easily slip through the fabric and right through the catchment column at any point before you end the float : the float is loosely slipped through the fabric: it is neither twisted nor knit into place. In this particular case, the color-pattern is quite simple: rectangular purple bars on a pink background. Therefore, for ease of handling and illustration, I chose to work a few pink rounds past the top of the purple bars. This brings us to the unhooking stage, the "U" in STUART. The idea here is to unhook the catchment column, thus releasing the floats parked on the fabric face. 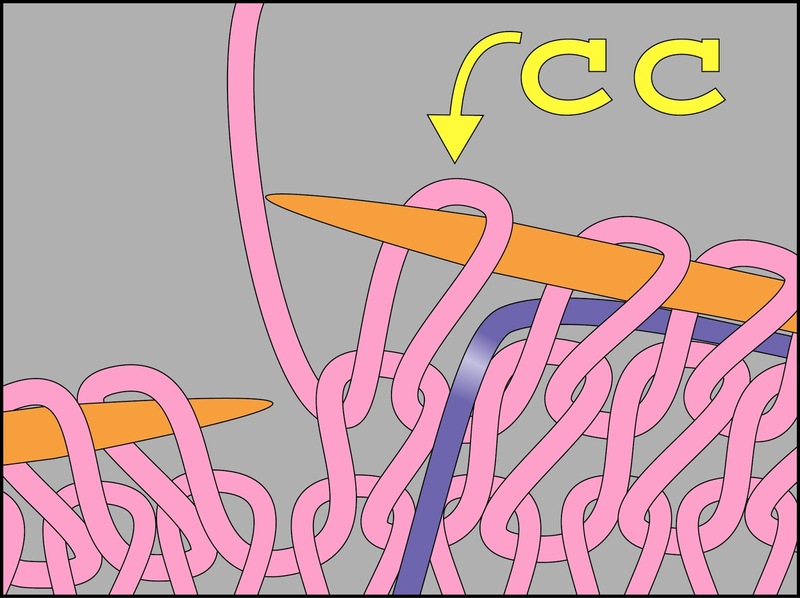 In other words, by dropping the pink stitches of the catchment column (cc) the purple blips is released from where they were slipped onto the fabric face. Below is a photo of the fabric front after the catchment column has been unhooked. Note how, within the dropped column, the purple loops are in front. Normally, I would not leave the bottom-of-the-run loop hanging loose like that--I just did it for illustration purposes. Normally, I would have inserted a crochet hook or bobby-pin into that open loop as soon as I finished running down the column to the correct row. The rehooking step actually has three parts: one in the catchment column, one to create the ladderback and one to permanently fasten the ladderback to the back fabric-face. Catchment column: In this next photo, I have begun the process of latching up the catchment column. This is done in the usual way for re-hooking a let-out column. Specifically, you insert a crochet hook into the bottom loop, then re-hook each ladder-rung in turn. Do you wonder why the pink ladder-rungs are not in sight? In this case, the purple floats are in front because you originally knit the work that way, with the pink yarn behind the purple in the catchment column. Letting out the pink column does not disturb this arrangement, so the purple floats remain in front, initially. Since you need to relatch the pink, which is behind at this point, you must carefully reach behind each purple loop in turn, to find the correct pink ladder-rung to hook up next. 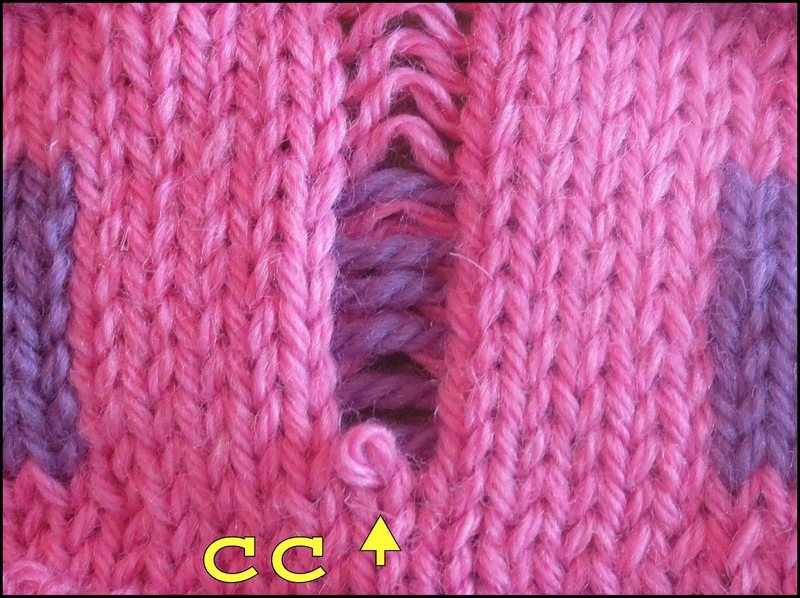 The easiest way to find the right rung is to locate the "tail" of neighboring stitch in the previous column (the one before the catchment column, in this case, column 5). 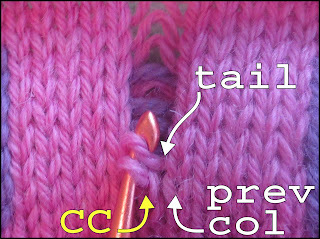 Tracing the tail leading from the bottom of that stitch will always lead you to the correct pink ladder-run in the correct sequence. 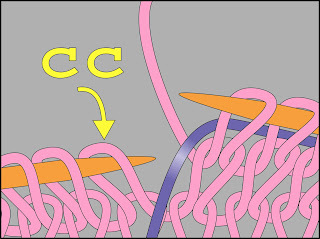 You can clearly see the tail/ladder rung hooked over the crochet hook in the below illustration. Once your each the pausing spot, remove the crochet hook, insert a stitch-holder (a bobby-pin or a safety pin works well) and flip the work over so the back fabric face is showing. You are now ready to do the second part of the "R" (rehooking) step--hooking up the floats into a ladderback. Ladderback: On the fabric back, you will see the released floats--in our sample, they are 11 stitches long: certainly too long and loose to be left that way. loose to be left that way. To begin the ladderback, simply insert the crochet hook under the bottom float and catch the second float with the hook-end of your crochet hook. Draw the loaded hook out from under the first strand. This forms a loose loop over the barrel of the crochet hook. Next, insert the hook under the next float up, then draw that float through the loop on the barrel. Continue in this manner. The photo below shows the fifth float looped up around the barrel of the crochet hook and the sixth float about to be drawn through. Continue in this manner until you get to the top of the purple floats. You'll have a roughly triangular ladderback, as shown below. It is now time to fasten the ladderback to the back face of the fabric so that it remains in place throughout future wearing. Remove the crochet hook from the top of the ladderback and insert a bobby-pin or safety pin to prevent an inadvertent run-out. Flip the work over again so the front is showing. You are now ready to fasten the top of the ladderback to the back face of the fabric. Fasten the ladderback to the back fabric-face: This is the last part of the rehooking step. It stabilizes the top of the ladderback by preventing it from shifting either horizontally or vertically. 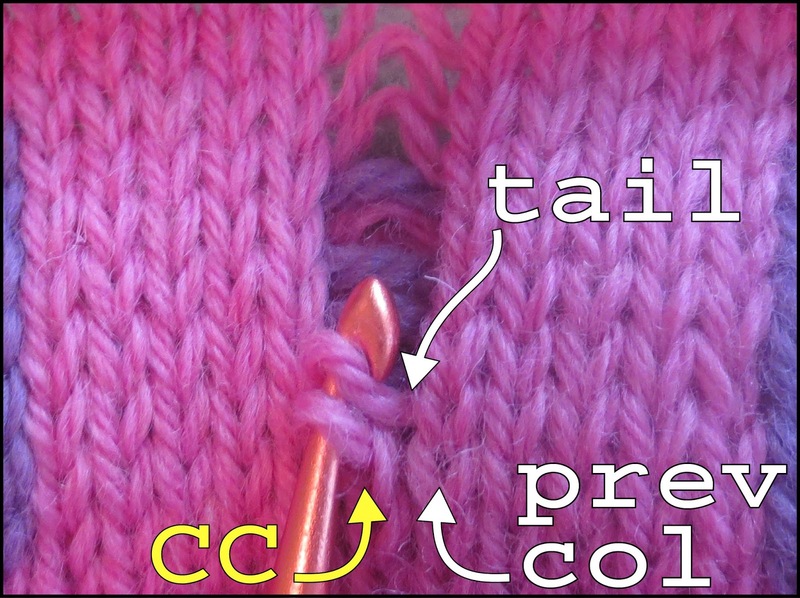 Working from the front, remove the bobby-pin holding the loop at the top of the catchment column and re-insert your crochet hook into that top loop (marked "X" on the illustration below). 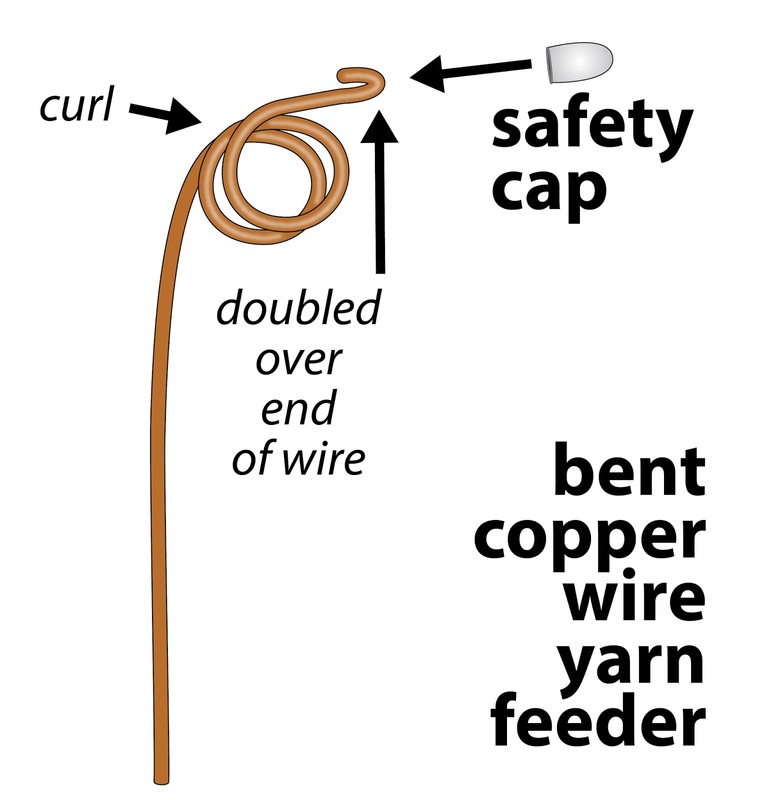 Next, remove the bobby-pin holding the top loop of the ladderback, and insert the hook into that top loop (marked "Y"). Finally, grab the next rung of the pink ladder in the catchment column (marked "Z"). Draw the rung (Z) through both top-loops (Y and X). This fastens the top of the ladderback to the back face of the fabric. Finish by latching up all the pink ladders remaining above the catchment column. The below illustration shows the final result, as seen from the back face of the fabric. You can see the top of the triangular ladder, marked "Y," is permanently fastened to the fabric back. As luck has it, the purple top of the ladderback basically does not show, not even when the fabric is stretched. 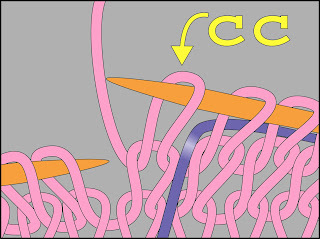 This is partly because the purple loop is entirely behind the pink stitch, and partly because the loose nature of the ladderback allows the purple yarn to stretch without forming any sort of pucker. Finally, the last photo, below, shows what the front looks like before blocking--the yellow arrow marked the bottom of the column, the yellow asterisk marks the top. As you see, even before blocking, the tension is really not too bad. This is because the slipped purple yarn takes up very little space between the pink stitches, so when the catchment column was knit, it had the correct amount of yarn already in it. Stated otherwise, there is very, very little slack knit into the catchment column, because the slipped purple yarn does not, in any practical sense, "take up room" between the catchment-column stitches and its neighbors. (This is the same reason why I recommend using scrap yarn as stitch markers rather than a hard ring of any sort.) When the catchment column is unhooked and re-hooked, there is very little distortion from extra slack. blocking, the distortion really isn't too bad! By the way: through lucky coincidence, the amount of slack which slipping adds to the floats provides just the right amount of extra yarn to create the ladderback out of the floats, without causing any puckering! FINAL POINT: Where to start the rehooking process. So, where do you actually start the unhooking process? The sample color-pattern is very short and very regular. If you had a more complicated pattern--especially one where the future rounds will create color patterns overlapping the catchment column, you'd want to work the unhooking step immediately after the end of each color pattern. In other words, drop the catchment column when it is easiest to undo: do not wait until you'd have to drop through a different pattern first. Another thing to think about: this sample is geometric, very regular. However, if you are knitting an irregular shape, you might have several rows with very long floats, followed by rows with much shorter floats. In this case, you'd stop the catchment column and work the "unhook" step at the point in your pattern where the float is no longer "too long." In other words, once the color-pattern you are knitting has the float come back down to something more reasonable for a regular float (5 stitches, say) then you no longer need to break up the float. It is at this point in your knitting that you'd unhook/rehook. Bottom line: unhooking and re-hooking is a "finishing" process yes, but, unless the catchment column runs the entire length of your project, you do not wait until project-end to to unhook and re-hook. Rather, work the "UART" part of STUART as-you go: at the top of each catchment column as dictated by your color-patterns. To see STUART in action on a project, go to the next post in this series: STUART ladderback jacquard gallery, part 1: Skeleton hat "Round Dance." At left is a little preview of the STUART project featured there. There is a third post in this series also, called Long floats in color-knitting: Modifying STUART ladderback jacquard for rough-use situations. You can now sign up to get e-mail notifications when there is a new TECHknitting post. The sign-up is located in the right ---> sidebar. As to Ravelry, the "friends' blogs" notification does not seem to be working very well--evidently, there is something a bit off about my feed, whatever that might mean... So, sign up and be my Ravelry-friend by all means! Please! But if you want notifications, it'd be better to rely on e-mail. Facebook? Well, I did have a page on there but they kept messing with it--removing it, reinstalling it, removing it again. We seem to be at an impasse, Facebook and I, so for right now, it's Twitter or e-mail. I recognize myself to be a computer idiot (sorry!) but anyhow, I think this e-mail notification is a big step in the right direction. Here's a way to completely avoid the jog when knitting single rounds in different colors. Not only do you avoid the jog, but your ends are worked in at the same time. Introducing "smoothed circles." When you knit circular (i.e. : knit a tube on dpn's or on circular needles) you are actually knitting a spiral. Because of this, the beginning of a round is actually one row below the end of the round. In one-color knitting, this is not noticeable, but the failure to match up definitely shows when you go to work stripes-especially narrow stripes. When knit, every color change shows as a "jog." The HELIX (barber-pole) technique does create jogless stripes of single-round color, yes, and in that regard, they are the most like smoothed circles of any jogless join. However, they have several downsides. At the start of the work where the color stripes begin, there unavoidably appear several one-color starter-stripes--one starter-stripe for each color. This same thing happens at the end of the work. 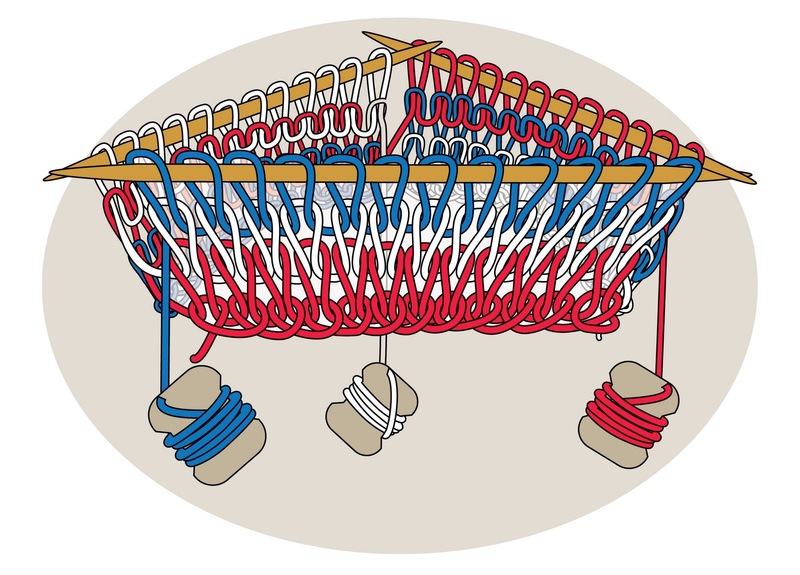 On this linked illustration, note the bottom one-color starter-stripes of red, blue and white at the bottom of each needle-section, for further views, have a look at Grumperina's famous spiral socks. 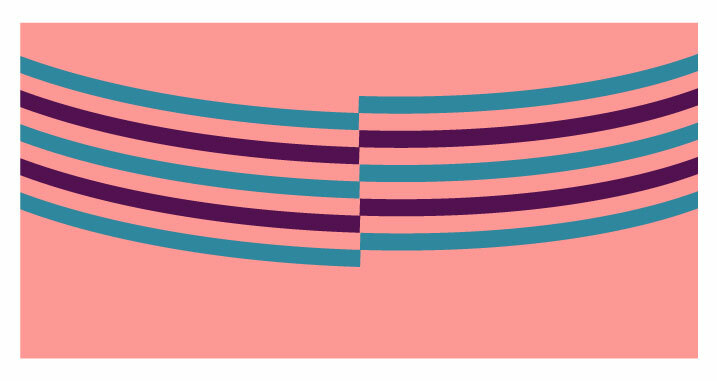 Barber-pole stripes slant, and the more colors you use, the more pronounced the slant. The biggest drawback: barber-pole stripes are really only meant for two- three- or possibly (if you're a masochist) four colors, and those colors **can't change** over the entire length of the work or you will certainly get a jog. By contrast, with smoothed circles, each round can be a completely different color, yet no jog will appear, regardless. all the ends wind up where the column is. when the colors change with every single round, that's a LOT of ends to work into a very narrow space, with fabric-distortion as the usual result. By contrast, smoothed circles start and stop at random places on the fabric-back, resulting in far less distortion. 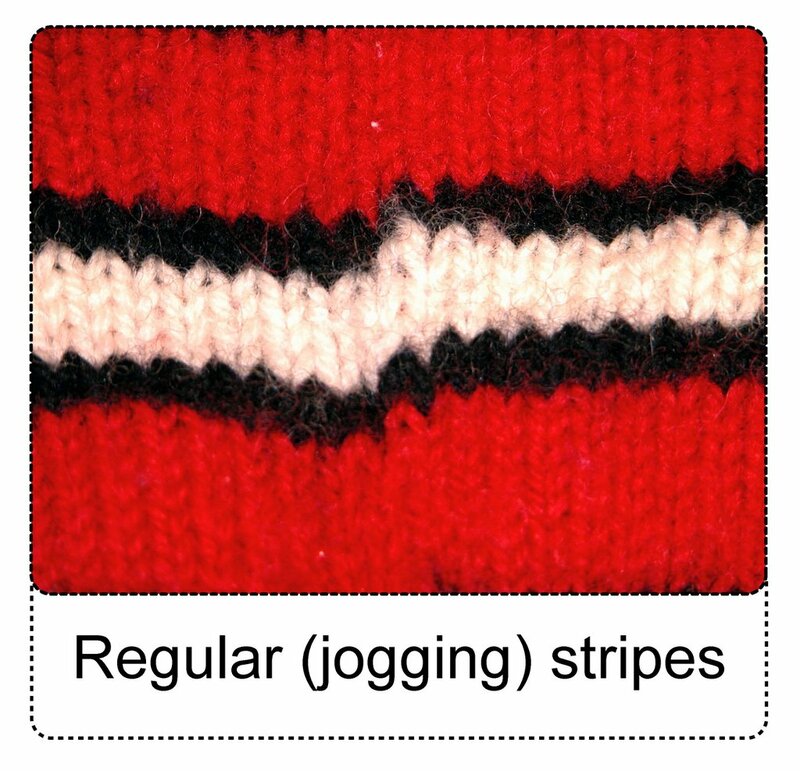 steeking is not suited to tubular items knit in the rounds, such as hats, mittens, socks, sleeves. 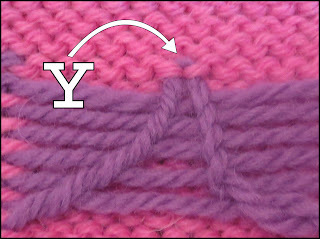 Bottom line: Smoothed circles work where other jogless techniques do not, to avoid a jog when knitting SINGLE ROUNDS of DIFFERENT COLORS. In smoothed circles, each round is actually a perfect circle, with an overlapping beginning and end--this is the "smoothing" referred to by the name. The fabric is created from stacks of these perfect circles, each starting and ending in a different place so as to avoid fabric-distortion. Crocheters will recognize this as similar to how rounds are worked in some kinds of crocheting--the end of one round is fastened to its own beginning and each different color begins in a different place. This is a common technique in granny-square construction, for example. At round-end, each round is fastened to its own beginning by re-knitting the first three stitches, one at a time into the stitch UNDER the original stitch. 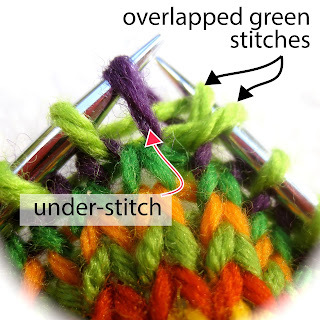 This re-knitting creates a 3-stitch wide "afterthought overlap join." This not only closes the gap between round-end and beginning, but also secures the tails without need for further finishing. When, in the next round, you come to knit over the join, you treat each set of 2 stitches as a single stitch, knitting each set of 2 together. Each round is started in a different random spot, as far from other joins as possible--you get to the starting place by simply slipping stitches. After adjusting the final tail-tension, the tag-ends are clipped short to hang forever inside the garment, with no further ado. To see these steps in greater detail, with lots of pictures, read on. STEP 1: Each smoothed circle begins/ends at different place on the fabric back, as far as possible from previous joins. In the samples pictured below, the green round being worked is atop rounds of purple, dark green, orange and so on, so it should start as far away as possible from where the purple, dark green, orange, etc. rounds started. To get to the starting place, peek over the needles to the fabric back, figure out where you want to start, then slip the stitches from the L needle to the R needle until you get to that your target spot. When slipping, keep the stitches "open." In other words, the stitches are transferred from needle to needle with no change in orientation and no twisting. 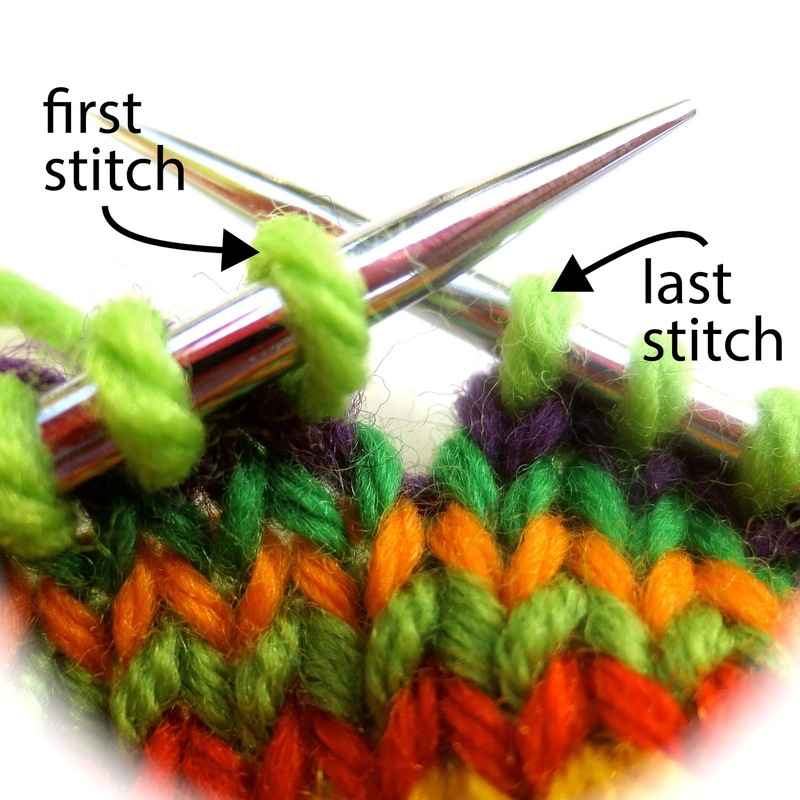 STEP 2: in the illustrated sample, the round we're knitting is green, so once you're at your starting place, take some green yarn into your hand, leave about a two-inch tail and simply set off knitting--for this tutorial, I'm assuming you're using stockinette stitch. 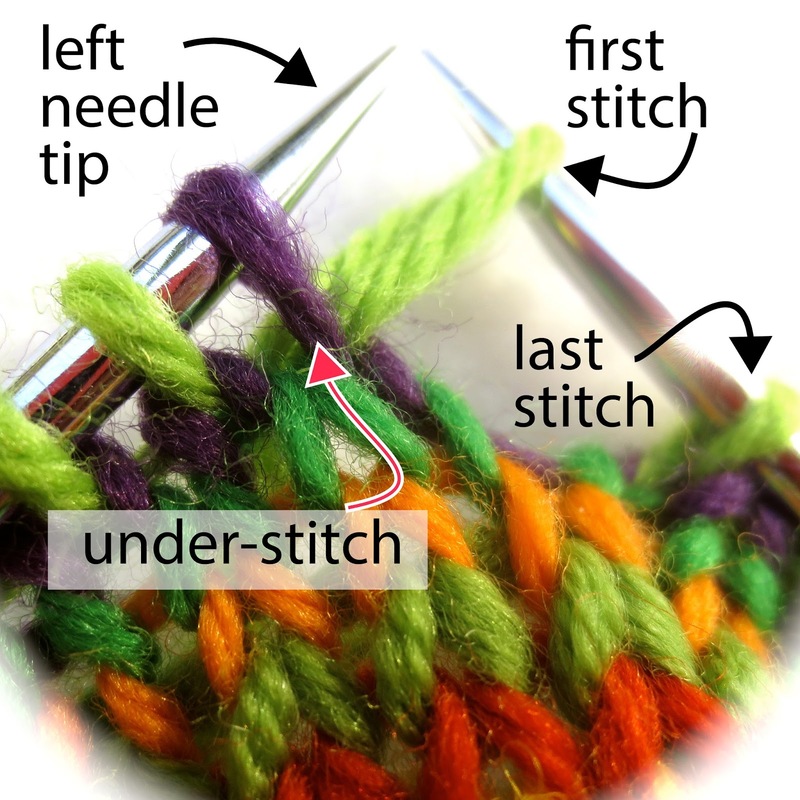 When you get to the end of the round, your last stitch will be on your right needle, the first stitch will be on your left needle, the work should look like the photo below. If we simply ended this round here, the gap between the first and last stitch would show as a hole in the fabric. In the next several steps, we're going to fasten this gap shut using a trick called the "afterthought overlap join." STEP 3: Pull the first stitch onto the right needle. This will put it next to the last stitch, as shown below. Note the purple stitch under the first stitch--it is labeled "under-stitch" and picked out for you with a red arrow. This under-stitch is going to be important in the very next step. 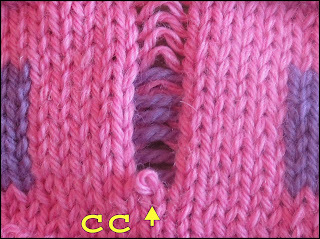 STEP 4: Pull the under-stitch onto the left needle tip, as shown below. 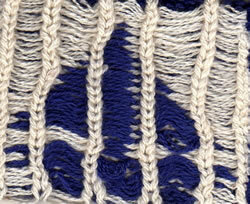 STEP 6: The knit stitch is completed by drawing the running yarn through the under-stitch. ** The result is two green stitches drawn through the same under-stitch: the first green stitch being the first stitch of the round, and the second one being the new end-of-round stitch you just knit. You can see both stitches on the photo below. You might find that when you try to draw a second stitch through an under-stitch, the first stitch wants to slip and slide off the needle. If so, use a spare a finger to pin that slippery little thing to the knitting needle as you pull the second stitch through. End this step by dropping the purple under-stitch off the left needle, you do not need it any more. For each of the next two stitches, you repeat steps 3 through 6. In other words, the second and third stitches of the row-beginning will be overlapped by two more round-ending stitches. 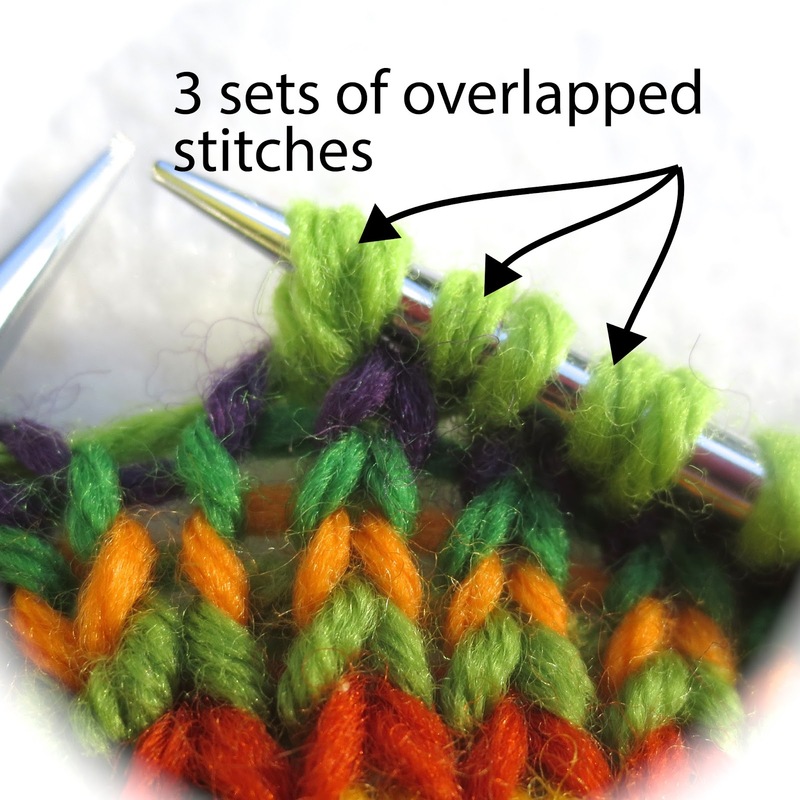 The net result will be three sets of overlapping stitches. After you have knit all three stitches with the running yarn, you can cut the running yarn loose. A two-inch tail would be appropriate at this time. The below pictures show the front and back of a completed afterthought overlap join. As you see, each under-stitch now sports two loops. When you come to knit over the afterthought overlap join (just as when you knit over ANY overlap join) you knit each set of two stitches as if it were one single stitch. The afterthought overlap join yields three wonderful results. Tug the hanging tag-ends somewhat firmly, then stretch the fabric out again. Repeat. This begins the process of settling the ends within the fabric and helps determine the final length of the tag-ends. Snip off the ends without further working-in: three-quarters of an inch is a good length for non-superwash wool, an inch-and-a-quarter or even an inch-and-a-half is good for slippery yarns such as synthetics, silk, bamboo or cotton. It is true that there are two tag-ends for every round. However, after the garment has been washed several times and is properly broken in, the ends will have settled into their final length. At that time, they can be re-trimmed shorter. Not working the ends in also means each join has the minimum of bulk. Leaving short ends dangling also greatly reduces fabric-distortion. 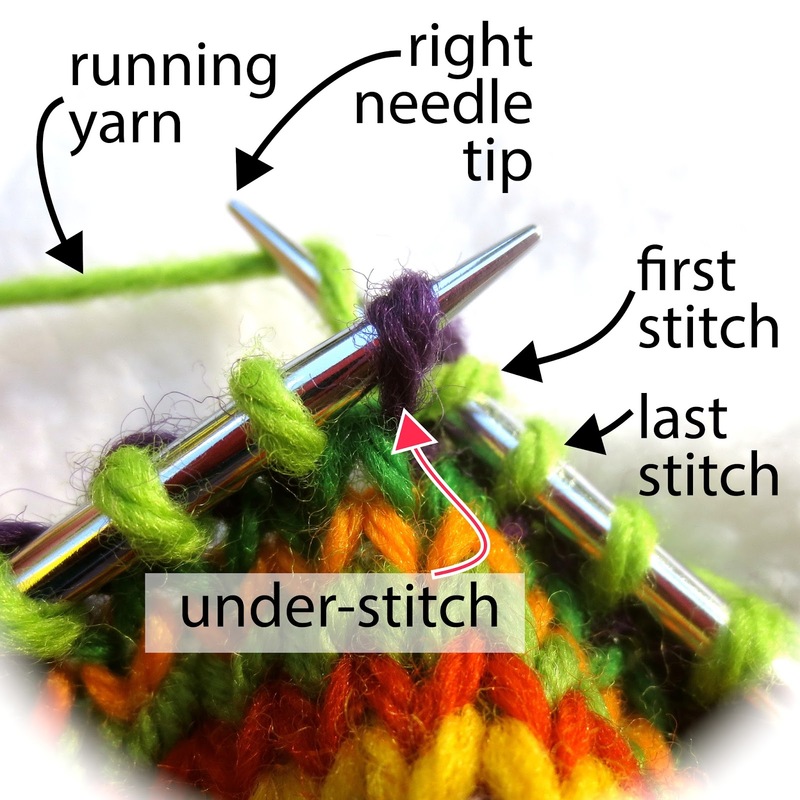 If you are concerned about the join pulling out, it would be better to work four or even more overlapping stitches, than to try to work in all those hanging tag-ends. The below photo shows how the round beginning/ends are widely distributed on the fabric back, and also shows a good length for the final trim of the tag ends in wool. This last photo is a reposting of the opening photo, showing the fabric from the front, and yes! there are several joins in the picture. Fabric front--can you spot the joins? Remember! when you come to work over the afterthought join, each set of two stitches is worked together as one stitch. 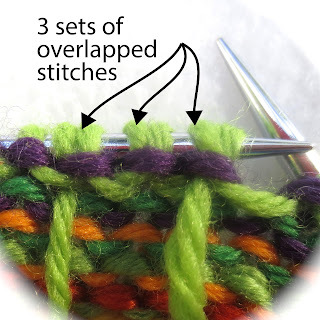 In other words, the six loops (3 sets of two) in the afterthought overlap join are worked as three stitches, not six. 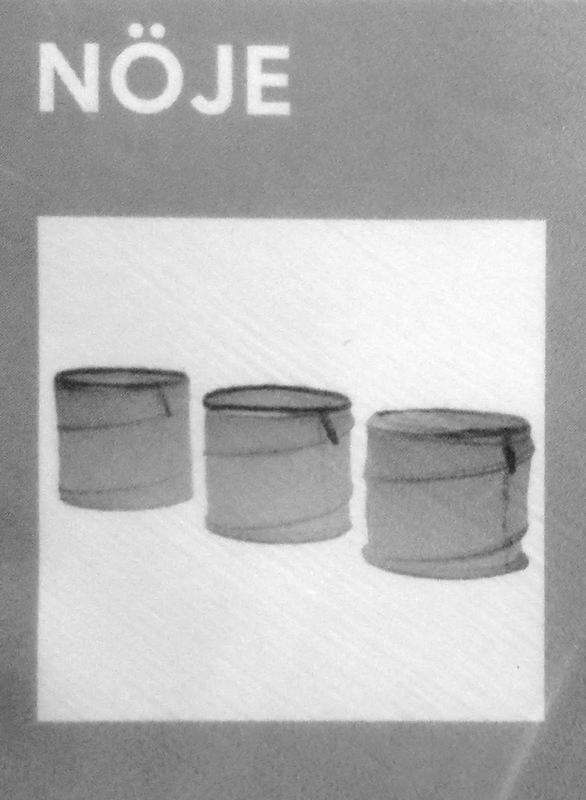 If you want to know where the beginning of the round is for shaping purposes, place a marker in the fabric and work the shaping as directed, but do not use the maker for indicating color changes. The more widely distributed the joins are on the fabric-back, the better the overall look of your fabric. Smoothed circles via "afterthought overlap joins" --the subject of the above post-- work really well for single-row different colored stripes. But here at the end of the post, I'm going to go off on a little tangent and show you a different **bonus trick** for smoothing out the tops of wider single-color stripes, a trick called "Ha-YES." So why have I included this bonus trick at the end of a post about smoothed circles? Because smoothed circles are often worked on a foundation of wider single-color stripes. As stated above, adding wider stripes has the advantage of tying together the color scheme, as well as smoothing out the gauge. This bonus trick shows how to set up these wider single-color stripes so they provide a nice flat ring for your smoothed circles to lay upon. 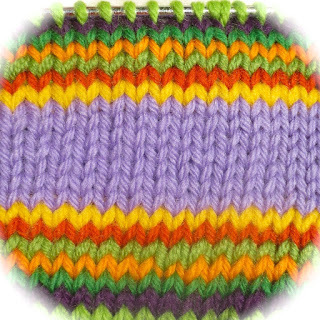 When you knit a wider stripe as the base foundation for a smoothed circle, such as the lavender stripe in the sample above, you could just drop the lavender yarn, leave it hanging with a four-inch tail, slip the work a few stitches over, then start off knitting the first smoothed circle with your first color. When you got to where you dropped the lavender, you would simply knit over that stitch. At the end of the project, you'd pull the tail of that last lavender stitch rather tight to decrease away the height difference at the round-end, then work the lavender tail in as part of the finished process, via skimming (with a sewing needle or with a knitpicker) or via weaving. You see, as wide as the lavender stripe is, there is plenty of lavender fabric to soak up a worked-in tail without fabric-distortion. However, here is a little bonus trick you might like to try instead, a trick I am calling Ha-YES (stands for "Half-back-join-ish Yarn Ender & Starter"). Not only does Ha-YES work smooths the top of the main color round, eliminating the jog and setting up a foundation for a stack of smoothed circles to follow, but it also works in the tail, making finishing much easier. OK, ready? What you do is, at the end of the wider lavender stripe, take the lavender yarn and double it back on itself, just like in the real back join. Knit TWO stitches with the doubled yarn, also like in the real back join. At the end of this, you should have a single loop of lavender yarn sitting on your R needle--a loop just about the size of a stitch. 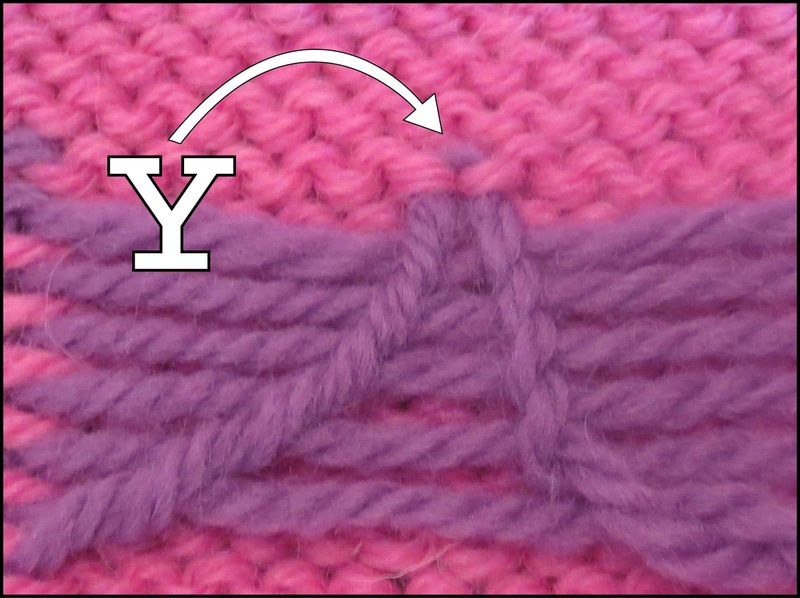 If your loop is too big or to small, rip back the two stitches just knit and adjust the amount of yarn doubled back. 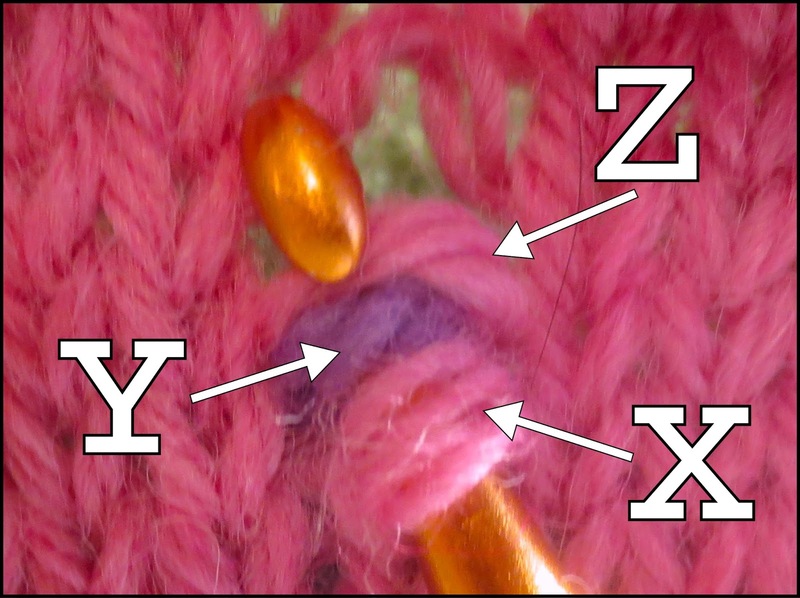 After a few times of doing this, you'll "just know" how much yarn to fold back before knitting the two stitches. That single leftover loop? Leave it on your R needle, then slip the next stitch parked on your L needle onto the right needle, then snip the lavender yarn leaving a 2-inch tail. The join is finished and you must now slip several stitches (at least) past the Ha-YES round-ending to start your first smoothed circle, same as you slip to a new position to start any new color round. On the next round, when you come to knit over the top of the Ha-YES round-end, you essentially have 3 sets of 2 stitches, same as you would have with your afterthought overlap join. Knit each set of 2 sts as a single stitch, turning 6 loops into 3 stitches, same as with any other overlap join. 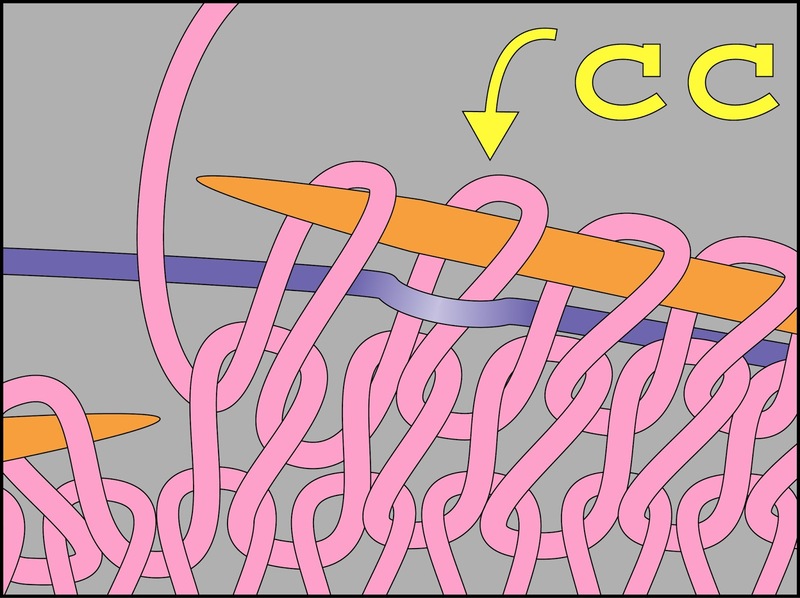 * In the illustration for step 5, the running yarn trails off to the left, as it would for continental knitting. If knitting English-style, the yarn would trail off to the right. However, the wrap over the needle would be identical. **Does the step 5 and 6 maneuver seem vaguely familiar? 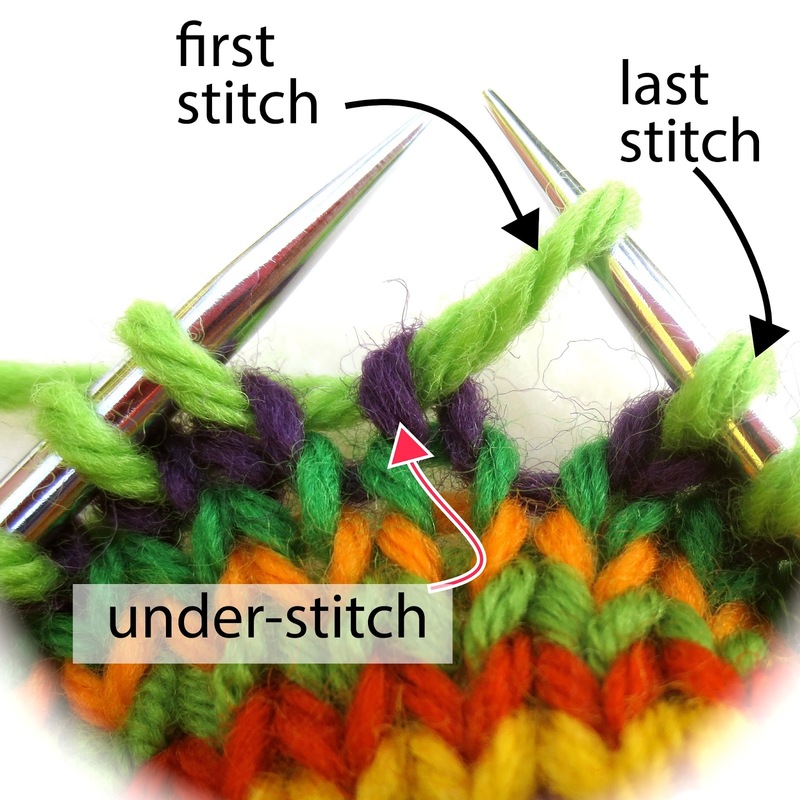 Knitting into the under-stitch is very similar to a trick called "knitting into the stitch below." 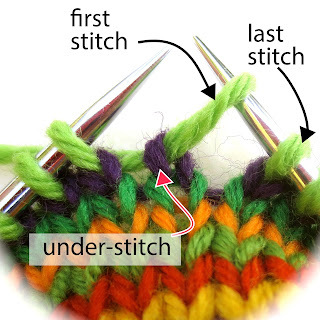 The important difference between them is, when knitting into the under-stitch, you wind up with two loops on your needle, whereas with knitting into the stitch below, you do not. Knitting into the under-stitch is also first cousin to a different trick called "nearly invisible increase." However, knitting into the under-stitch is worked somewhat differently, and most importantly, does not increase your stitch count, whereas nearly invisible increase is...well...an increase. As stated in the text, when you come to each set of two overlapped stitches arising out of the same under-stitch, you knit them together as one, instead of treating each loop as a separate stitch. In this way, your stitch count remains the same.